We still haven't figured out how to download the fancy ParkRTC app to our Nokia flip phone, so it's been a while since we've picked up a cheap plastic flag to cross the street and check in with things in our fancy, if somewhat emptier, ersatz urban core. What's been doing? Well, as the trickle of departing stores continues, Reston Town Center got itself sued -- again! -- by yet another tenant. 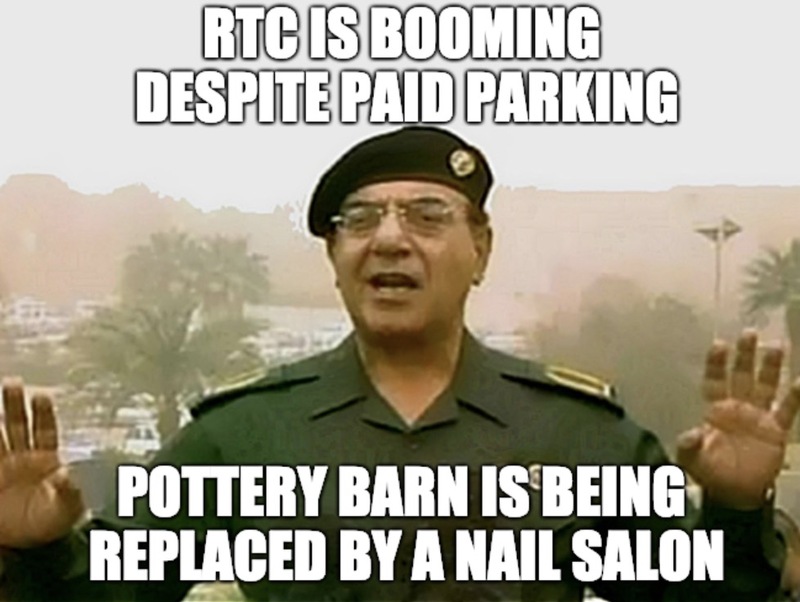 Now it's Uncle Julios claiming that RTC's easy to understand and universally beloved paid parking system has cost the restaurant $1 million a year in lost sales. That's a lot of chocolate fountains. And apparently would-be tenants actually read the newspapers, as ramen bar Jinya, which announced in December it would take over the space occupied by Busara, apparently decided instead to "look for better opportunities." At least nine businesses left RTC in 2018, followed by Pottery Barn and Williams-Sonoma just this past month. By one count, more than 20 businesses have departed since the awesome paid parking plan was put in place to universal acclaim way back in ought-seventeen. We don't know if the elite crisis management team is still collecting a retainer from RTC, but shortly after the somewhat embarrassing news about Jinya someone quickly cranked out a press release suggesting that fleeing businesses and empty storefronts couldn't be further from the truth, silly rabbits, and RTC owner Boston Properties is literally so swamped with exciting new retail concepts it had to hire a new leasing agent, not that there have been any problems with parking-we mean leasing! More specifically, sometime in 2019 we're getting a nail spa, another coffee chain (hello Peet's), two new restaurants, True Food Kitchen and North Italia, a workout place called DC Row, and an (already delayed) "paint bar," which we'll just say will give Jacksons a run for a portion of its Chardonnay-sipping clientele and leave it at that. Which is a bit strange, as one plausible theory as to why Boston Properties has been willing to put up with the dent in its reputation (not to mention its leasing revenues) is that paid parking would help weed out the more midscale chain retailers and food purveyors in favor of more upscale ones and finally show all those undesirables teenagers that RTC isn't intended to be a "third place" for everyone in the community to loiter gather, but a place for Serious Retail, by which we mean $150 shirts and whatnot. But when you lose Williams Sonoma and Pottery Barn, home of the $250 saucepan and $2,500 love seat, respectively, and you're bragging about landing a nail salon and yet another coffee chain... we dunno if that cunning plan is actually holding up. Commercial real estate is in a giant bubble right now. It's worst in big cities like Manhattan, where entire sections of 5th avenue that used to be bustling with high-end shops are now empty. It's not that no one wants to shop there, the problem is that landlords like Boston Properties let their business people get a little carried away, and they started trying to charge insane rents that no business could pay and stay in business. But that's not even their biggest mistake. Everyone in the business decided to pretend that it was just a matter of time until new tenants came in and paid the high rents, so they revalued all their properties under the assumption that the high rents were sustainable. So basically there are blocks and blocks of manhattan that are dead zones, but have extremely high property values because everyone in the commercial real estate business is lying to each other (and themselves). Is this starting to sound familiar at all? All's we know is that our equally earth-toned neighbor to the east just landed the biggest retail coup of the year so far. Not only is Vienna getting a Wawa's, said Wawas, like the rest of the town, will be painted a Reston envy-inducing Russet brown. I think a lot of people in Reston are continuing to boycott Boston Properties. Our family sure is. They are dead to us. We definitely don't go to RTC as much as we used to. Knowing the underlying greed of Boston Properties we have ventured to other places . I hope this can be changed for the sake of Reston. P.S. I'm from Manhattan and the once a month that I go home I see a new empty store front. Take a hint Boston Properties! FYI tons of cars getting booted today. RTC needs money apparently. I thought that on Saturdays parking at RTC was free, other than street parking So why are they booting cars? I do not patronize my bank's branch in RTC and I encourage my broker to relocate. They tell me ALL of their customers complain about the paid parking. The only merchant I patronize there is Jacksons who had the wherewithal to build free parking into their lease. I will NEVER upload the invasive parking ap onto my phone so I can be tracked all over. I will NEVER pay for parking in Reston. Paying for parking anywhere discourages my patronage. BP has vastly overstepped. They are no longer a 'good neighbor.' Heaven help the people who live in RTC and now have no free parking for guests and service workers. Reston is not Manhattan or London or DC. i've only been to RTC twice since the paid parking, and last time i opted for street parking and walkng further rather than pay for parking there. Also, a group i dine with regularly no longer considers RTC as a dining option due to the paid parking. Happily, there are LOTS of options that are not in RTC proper.